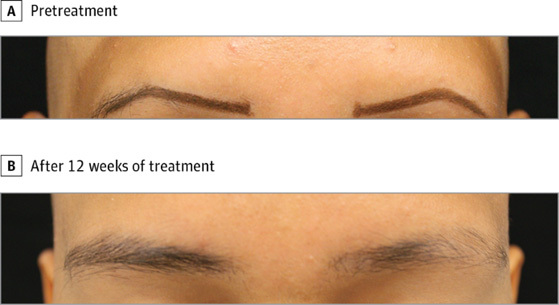 A woman who hasn’t hair in her eyebrows and on her head, for many years, now thanks to a new ointment, founded by the researchers at Medicine School from Yale, she could have beautiful eyebrows and hair scalp after using that. The patient (17 years-old) who suffering from bald-headedness has no more solutions to combat it. Baldness in a disorder that actually suffers tens millions of people around the world. That can cause hair lose in patches or complete loss of eyebrows. The patient tried several treatments but unsuccessfully. That was published on December 9th at Jama Dermatology. The professor Dr. Brett King and his co-authors have developed current formula for an oral medicine used for bone marrow problems. From JAK inhibitor class is the medicine ruxolintinib, that modify the immune system. Another oral JAK inhibitor, called tofacitinib, was used previously by the doctor, for hair restauration of a male patient with alopecia in 2014, but has been shown that ruxolintinib also restores the hair. The patient applied that new lotion for 12 weeks, twice a day. After that time, she had full of hair eyebrows and her head hair is partially increased. “The results was better than I expected” Dr. King said. “The effects of this cream is as good as the effect of the pills, in the same time of administration”. This cream is suitable for many people with baldness, even to people who fears of cancer or other infections associated with oral JAK inhibitors. Haven’t been shown any side effects for the patients who used this produce. “For a common autoimmune disease, this is the first solution which is based on our recent discoveries to show that is handy for millions of people with baldness, and we’ll continue to find treatments for it and for other disease.” said Dr. King. Lastly, while the effect were very bright, is required to carry out further research to decide the efficacy and safety effects of this form to medicine and it’s must to be approved by the US Food and Drug Administration (FDA). It can take several years before being placed in pharmacies, because this requires clinical trials on patients and results monitoring. At Clinicana Hair Transplant Center, in Istanbul, Turkey, we’re following the latest developments in the treatment of hair loss and we’ll show you the latest studies of this issue.